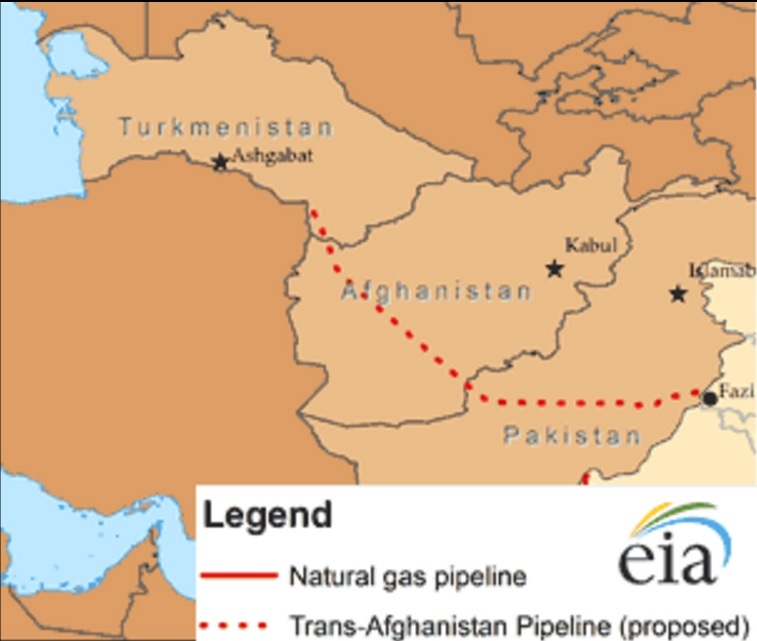 WASHINGTON — As leaders and representatives of countries involved in the Turkmenistan, Afghanistan, Pakistan and India (TAPI) gas pipeline celebrated the project’s inauguration, Afghan Taliban, in a rare announcement, vowed to support and protect the pipeline in areas under its control. In a statement emailed to media outlets, Qari Mohammad Yusuf Ahmadi, a purported Taliban spokesperson, claimed credit for the project, implying that it was initially planned during the Taliban regime, and said the group will ensure its security in areas under its control. “The Islamic Emirate views this project as an important element of the country’s economic infrastructure and believes its proper implementation will benefit the Afghan people. We announce our cooperation in providing security for the project in areas under our control,” the Taliban statement said. The long-awaited 1,814-kilometers (1,130-mile) pipeline project, known by its acronym TAPI, which will stretch from Turkmenistan and feed gas to Afghanistan, Pakistan and India, was officially inaugurated Friday by Afghanistan President Ashraf Ghani in the country’s western Herat province. Pakistan Prime Minister Shahid Khaqan Abbasi, Turkmenistan President Gurbanguly Berdymukhammedov and India Minister of State for External Affairs M.J. Akbar participated in the inauguration ceremony, which was held amid tight security to prevent possible attacks aimed at disrupting the event. The work on the Afghan part of the multibillion-dollar project has officially begun, and the project will take several years to complete. Ghani said TAPI is the start of a new beginning for the region. “We hope that this project [TAPI] will pave the way for hundreds of other projects and the hope is that our future generations will view this not only as the inauguration of a project and an economic corridor, but the foundation of a shared vision which will help us fight poverty, unemployment, extremism and insecurity in our region,” he said. “The policy of cooperation will ensure prosperity for our people, and economic prosperity is an important pillar of security and stability,” Ghani added. Taliban’s statement follows another statement by the group’s breakaway faction, led by Mullah Mohammad Rasool, which also said it would support the project and prevent domestic and foreign groups from jeopardizing the prospects of its success. “We will not allow any group or state to disrupt this project,” Maulawi Abdul Manan Niazi said in a statement sent to local media. It is very rare for Taliban insurgents to support a government project. The militant group is often accused of destroying bridges, roads, schools and other places of public interest in their attacks across the country. Meanwhile, provincial officials in Herat province told media that a group of 10 militants, who allegedly had been trained in Iran to attack the inauguration ceremony of TAPI, decided not to carry out the attack and instead surrendered to authorities. “Enemies of Afghanistan have instructed them to disrupt the ceremony, but they [militants] realized that this project would benefit the Afghan people and the next generations of the country,” Herat province Governor Mohammad Asif Rahimi told RFE/RL Afghanistan service. The Afghan Ministry of Interior said they would investigate the group’s claims. “Every country involved in such disruptive attempts should know that one day their future generations will pay the price as the fire will reach them as well,” Murad Ali Murad, deputy minister of Interior, told local media without naming any country. Iranian officials have not commented on this issue yet. Some Afghan officials, however, blame Tehran for supporting the Taliban in Afghanistan, a charge Tehran denies. Another gas project by Iran, Pakistan and India, known by its acronym IPI, is also underway, and some analysts speculate that Iran might view TAPI as a rival to IPI and try to disrupt it. Afghan President Ghani, however, rejected the notion that Iran is not happy with TAPI. The United States supports TAPI and views it as an important project for all the countries that are party to it. VOA’s Afghanistan service has contributed to this report. mortal enemies- or it is just initiated, all fresh, under another conveniently-labelled name; just like the creatively injection and promotion of the non-existent MULLAH OMAR of Taliban . Fake military games are mixed into dirty politics.in order to subjugate the entire region. ***** THE “ENRICHED PUPPETS” LOVE THE fakeries for the sake of their own fragil survival. NAMELY, ANGLO/US, RUSSIA AND INDIA. AND THE SAVAGE GAMES WILL BEE IMPOSED AS SLESYS. Sustaining anarchies under imposed military bonanzas across all of Afghanistan- that is the idea under the grand scheme of the invaders ! So, what does that suppose to mean ????? by invaders and I suppose they will be replaced by friendly Talibans; so th ey could protect the pipelines for the invaders. My goodness- it is unbQelievable ! THE RATS WOULD D OW ANYTHING TO GAIN A LITTLE STRATEGIC ADVZNTAGW. The local oppositions in Taliban high ranks in Qandahahr and HILMANDi provinces were attacked by foreign forces early this week in an order to clear the way for a free zone to the pipeline operations along the paths on those two provinces. The foreign forces are declaring the Taliban will let a smooth operation for the pipelines through their territories- oh; really !!!!! The only way for that posdibility would be if Those dislodged Taliban oppositions are replaced by friendly, so called, “Taliban”; so they then would be able to protect and honor the passages of pipeline for many hundreds of miles. My goodness- how could it be possible unless there is a an agreement with the local militias to protects the foreign interests in full compliance- so, is it the Taliban or a newly-formed task force under the protection of trusted militias. THE OCCUPYING FORCES WOULD DO ANYTHING TO MAKE SURE THEIR INTERESTS ARE RRMAIN INTACT AND SAFEGUARDED- OTHERWISE, THEY WOULD NEVER GIVE A DAMN..
LOGICALLY IT IS VERY OBVIOUS THAT THE MAIN MILITARY AIM ON THIS SITUATION IS TO GET RUSIIA AND INDIA FIRMLY INVOLVED ON GROUNDS OF AFGHANISTAN . THAT WAY THE NATO ALLIANCE WOULD HAVE MUCH MORE EXTENSIVE LEVERSGE OVER THE MILITARY DEVELOPMENT OF THE LARGE HISTILE AREA- OF COARSE; WITH THE BLESSINGS OF THE NEW INTERESTED AND INVOLVED PARTIES INSIDE AFGHANISTAN. THIS IS ANOTHET CLASSIC EXAMPLE OF INVOLVING ALL THE VULTURES IN AN ESTABLISHED WAR BONANZA- THAT IS WHERE IT IS, AN IDEAL OPPORTUNITY FOR A BUSINESS-LOOKING ENVIRONMENT WHILE CONSOLIDATING FORCEFULL MILITARY OBJECTIVE ON EXPENSES OF LOCAL INHIBITANTS. .ALL UNDER A STATE OF PERPETUAL ANARCHY- THE LOCALS WILL SUFFER THE WORST ON PLAYGROUNDS OF THE INTERNATIONAL WAR CRIMINALS AND THUGS AND THUG-MARS. IT IS A BIG EXPLOITATIVE MILITARY SHEME- BASICALLY MEANT TO TORTURE THE COLALS INTO SUBMISSION. THE PEOPLE OF THE WHOLE REGION. Afghanistan, Pakistan and whole of Central Asia. * whole of Central Asia. * THE PEOPLE OF THE WHOLE REGION. * Afghanistan, Pakistan and whole of Central Asia. * IN A BIG RUSH. *Right in front of you !